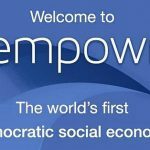 Is Empowr a Scam? Find out in My Empowr Review. There are programs that are completely legit and majority of people are happy with them. Their income claims are realistic, terms are crystal clear to everyone. It’s very easy to review them and give a verdict. And there are programs that are shady. Their terms are not clear and it’s hard to give a verdict. Empowr is exactly one of such programs. I’m going to review it and help those of you that want to join it but have some doubts. I did my research and to be honest it was not an easy task. Right from the start I want you to know that this program is not in my recommended list due to the cons that I’ve discovered and due to many complaints that anyone can find on the internet via Google. For some people Empowr is legit because they have been able to make money with it. Many others lost their money. To answer the question: Is Empowr a Scam? My answer would be: I don’t know. I’m not sure to be honest. I’m on the fence about it. It’s up to you to join it or not. I personally don’t recommend it for a number of reasons and within my review I will try to explain why. In short, the creator of the program claims that his program is like Facebook that allows people to post, share, like, blog, advertise and at the same time make money from all this activity. Facebook doesn’t pay you for that though it’s a multi-billion dollar company and has enough money for that. But Empowr is unknown company but their claims are really huge. To me it doesn’t look trustworthy at all. It’s hard to say if Empowr is a scam or not. It makes some big claims. There are many complaints and many people lost money in this program. Though some people made money. I recommend to avoid it! Instead try my recommended program. It’s completely legit and is FREE to try. 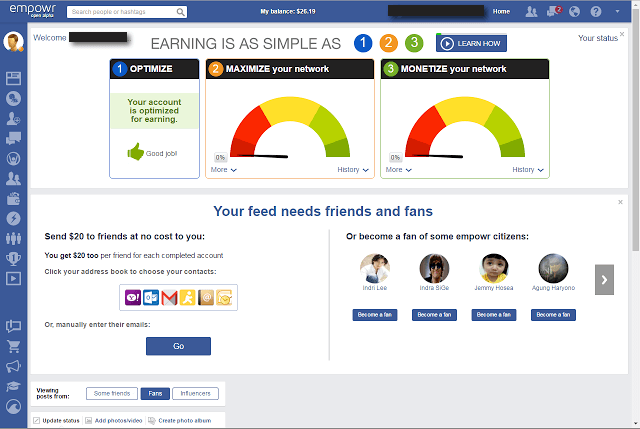 First of all, as I said, Empowr is a social platform where people can do some activity such as, write a post, share it, like it, advertise and earn money for doing it. It’s not the only platform that offers this kind of service. I’ve seen such programs in the past. In fact, Empowr is not new. In the past it was called Fanbox and then they made some improvements and it became Empowr. And of course, Fanbox had the same rating and many complaints as Empowr has now. Their policy was not transparent as well. It wasn’t clear how people made money and it’s still not clear how folks are making money with Empowr at the moment. You can’t fully control your account because it’s not clear how you actually make money and when or how and why Empowr charges your PayPal account. It’s not just my opinion about the program. Many Empowr members seem confused and are not happy with the quality of the service. Empowr claims you can make money easily by being active at Empowr website but many members don’t understand how they actually make money. Many members seem to make money without taking any action at all. Isn’t that strange? But in order to cash out they need to wait 30, 60 or even 90 days. And before that their account will be charged for the unknown amount of money. Like I said above, it looks a little shady. In oder to pay you as a member, Empowr needs to first earn money. They charge other members for unclear reasons and this way they get funds in order to pay people like you. If you publish some content on Empowr network you are going to use their ad credits. Those credits are deducted from you as Empowr member. The problem is that there is no information regarding the amount of money you earn when you post something on Empowr website. And there is also no information regarding the amount of money that will be charged from your account. You also pay 2,9% for using Empowr network plus some other fees. In fact, you have to agree to their terms which means your PayPal account will be charged whenever Empower decides so. You decide if it’s acceptable for you or not. For me personally it’s not acceptable. And this causes many problems because many Empowr members are complaining because of their account being charged without any notification. 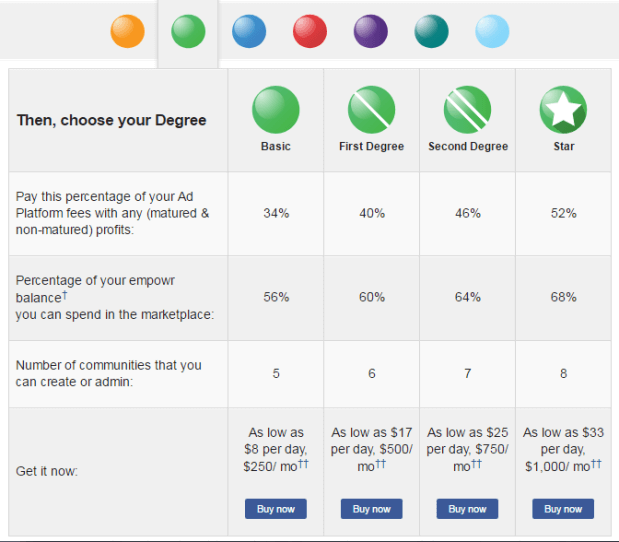 For example, if you advertise something on Empowr network you will be paying from your ad credits. This means if you earn let’s say $500 you don’t know how much you will be charged from your ad credits. Plus you will be charged right away. But in order to get your earnings you need to wait up to 60 or 90 days. This is really strange and even annoying in my opinion. It’s really difficult to understand how Empowr works. The worst thing is that some people can’t even cash out their earnings. 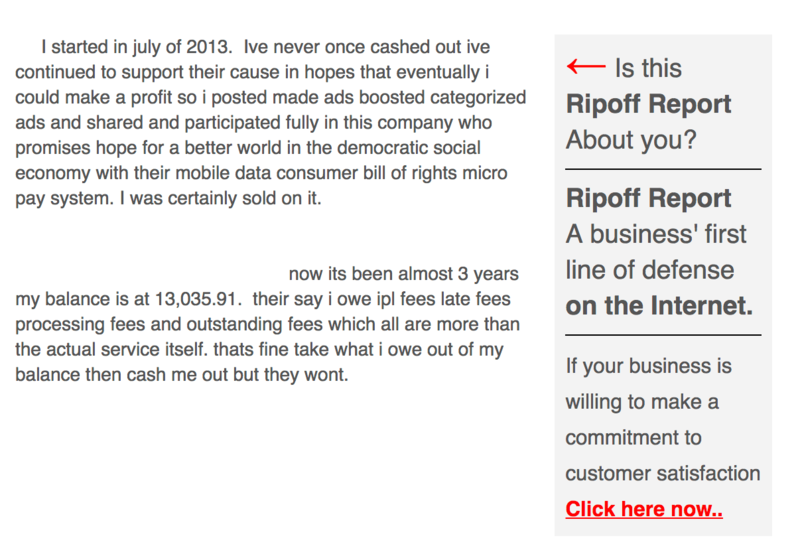 See the screenshot from Ripoff website. They also offer you several levels within the system so you can have higher levels in ranks and higher earnings. But this means that you need to spend more money within their system. You choose number of posts you want to create or number of shares, likes, comments, reposts, number of bids. But it’s not clear how much you can earn. As I can see, prices are pretty high and not everyone can pay so much per month and then sit and wait 90 days before you can cash out your earnings if any at all. And the worst thing is like I said, you have to pay immediately but cashing out will take up to 60 or 90 days. If you like this type of so called business then join Empowr. I personally choose to avoid it completely taking into account the number of negative complaints that I came across on the internet. Is there a way to make more money with Empowr or pay less in fees? The system also suggests that you optimize your account which means you will be making more money. But it also means you will be paying more money as well. Once you have a lot of credits in your account and optimize it the system will take from your earnings and you can end up having way less in your account than you actually spent. Who knows, maybe this is the exact reason why so many people complain about Empowr. And the bad news is that there are also many complaints about their support that is not always responsive or helpful. As I said, before Empowr was a FanBox. This company is almost the same and its history and reputation cab be checked at BBB.org. I checked it and it looks like the situation is not so good. Again, there is a ton of complaints from their members and the overall rating for this company is extremely low. You can read more information at BBB.org website if you want. But the main idea is that there are serious issues with either of them FanBox or Empowr. I believe you better avoid Empowr and keep your hard earned money. I did a research and found many complaints about Empowr on the internet. If you take a look at the screenshots below you will realize that there are various types of complaints about Empowr. 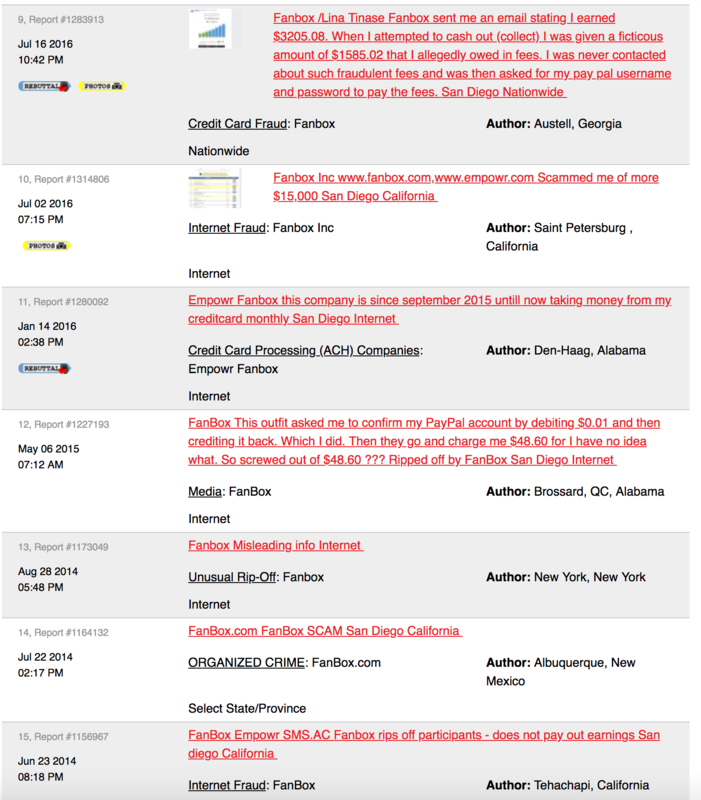 As you can see, some members complain that their account has been charged without any notification. Others complain because Empowr doesn’t explain why they charge the card. Some members complain because Empowr doesn’t pay out their earnings. Many people complain because they can’t cash out their earnings for 90 days though Empowr charges their account immediately. Many people report of receiving emails from Empowr in which they are informed that have earned money but an interesting fact is that they have not been taking any action for days. How then could they earn money? I think there are so many issues because Empowr is relatively new and its reputation is not solid enough. I’ve seen many programs like this in the past. I think it will either improve over time or will be shut down. The future will show. 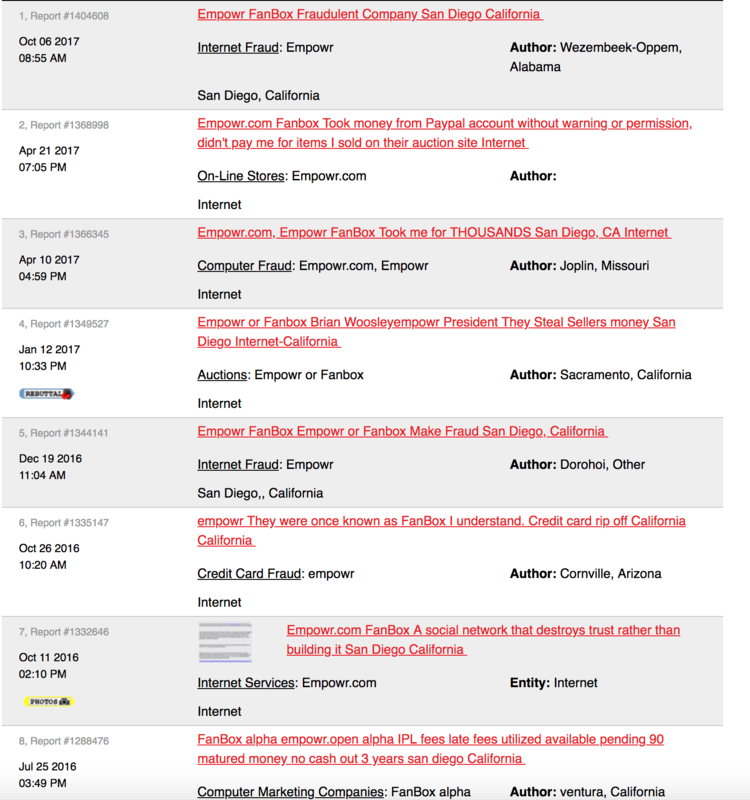 BTW, you can find many complaints about Empowr and Fanbox at Ripoffreport.com website. Can you make money or become successful with Empowr? Based on what I’ve learned about Empowr I can tell you honestly that some people have been able to make money with this program. Others lost their money. Some even were not able to cash out their earnings. There are many types of complaints that you read above. You can also continue your research and I’m sure you will find even more complaints on authority sites, such as ripoffreport. You can also find complaints on other blogs in the comment section. In short, when it comes to Empowr, the truth is that maybe you can make money. Maybe you will lose your money. It’ really hard to say what will be your experience with it. There are really so many legit programs that I described in this article and there is no need to get into trouble with programs like Empowr. Many people complain that Empowr charged their account or card without prior notification. So, I really don’t know what to say. If I say Empowr is legit and you will lose money you will be swearing at me. It’s up to you to decide to join Empowr or not. Considering that there are many complaints about this program I would rather recommend to avoid it completely. In short, due to many complaints, money loss, terms being not transparent I think Empowr is by far not the best opportunity out there. It’s not clear how you make money with this program and it’s not always clear how and why they charge your PayPal account. If you want to try it, it’s your decision. If you lose your money it will be your responsibility because I already warned you about potential issues that may happen to you in case you join Empowr. I can’t tell you how it will work for you. Is Empowr a scam? I really don’t know. But I can tell you that programs like Empwor never stay long. All I know is that this program is a little shady and there are many complaints out there. But there are some happy members too. How will be your experience with Empowr is unclear. My recommendation is to avoid it and instead join this legit program that I personally tried and many others tried and shared their positive experience. I think that from start to finish empowr is an absolute scam!. Any site or system that changes its name is generally best avoided and scammy. My initial thoughts were that it is was some kind of product or system related to the empower network program. It looks more like they are riding or surfing on the popularity of that and thus the similar sounding and looking name. As I said in my review it’s difficult to tell if it’s a scam or not but it definitely looks like a scam. No, it has nothing to do with another popular scam called Empower Network that finally collapsed after scamming thousands of naive people. After reading all complaints and negative comments and reviews within my review it becomes clear that Empowr smells bad and it would be better to avoid it. I think the fact that many others have already lost money in this program should teach us a lesson how to not invest our hard earned money in wrong programs. Thanks for the honest review of empowr. I have not heard of this company before but will definitely be avoiding them now. It definitely is suspicious that you can make money just by simply being a member. Something does not add up. 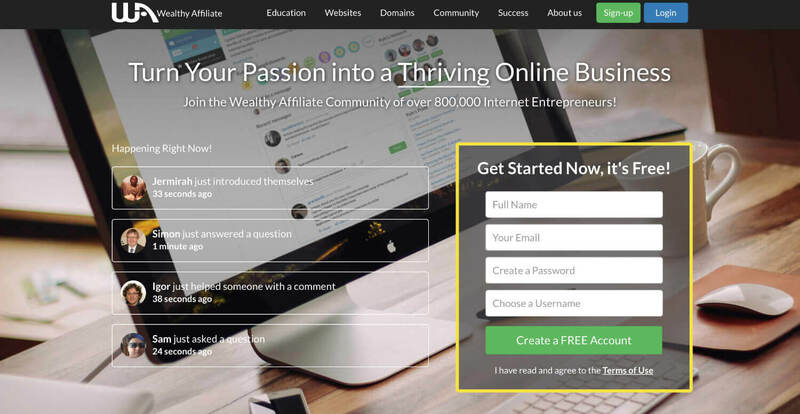 You have used wealthy affiliate and what is their service like? I heard some amazing things about them. I think so too. Many low quality programs change their names after getting a lot of complaints. I’ve seen it in many other programs. As you can see, the programs has many issues and it’s clearly seen in the screenshots of the complaints. I’m glad to hear you are a member of WA. I’m happy with the quality of the program. I’m not a millionaire but i’m making a solid monthly income. Many members are doing alright and making way more than i’m making. Yes! it is a definitely scam! People often believe in such things and think that they will make money just by clicinkg on something. 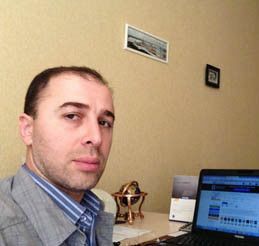 THere are many other ways of earning on the Internet such as blogging or Internet marketing, but people like to be scammed. Empowr cant make you even a dime, so dont believe in it. I really don’t know if it’s a scam or not but it’s definitely not something I would recommend. And aside from my recommendations I shared enough facts here about issues with Empowr. After reading about all these facts it’s really hard to find an argument in favor of this program. You are right Daniel. 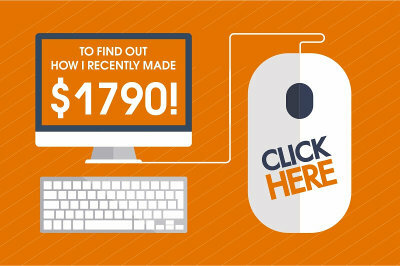 Instead of clicking in the hope that you will make money it’s better to blog, provide value and money will come. This industry is really huge and there are many ways to monetize your efforts online. i joined empowr 3 days ago. In 3 days they withdrew $30.00 (!) which were immediately refunded, but they could have taken me overdraft (and get fined by my bank), and every single day they withdrew $1.75 for ads that were never published. As soon as i found out i cancelled the pre-approved payment plan from my paypal account (which wasnt visible from the beginning) and changed my password. In less than an hour they reduced my online empowr balance by 25 more dollars without any notice and brought me to higher level subscription. At least i had cancelled my paypal payment!!! 60 dollars rip off in the first 3 days, its unbelievable!!!! I deleted my account last night, totally pissed off with the scammers, still not sure whether my paypal is safe and protected from them. Stay away from this scam, they are absolute thieves!!!! I’m sorry to hear this story Helen. I totally understand your frustration Helen. I’ve seen many scams online and people that were scammed by them. It’s not surprising to hear that Empowr tries to charge your account without any prior notification. I already told about it in my review. And I’m really glad that review was honest and I showed all those issues that other people had with this program. I think you made the right decision by cancelling your Empowr account. I believe it’s a waste of time, energy and worst, your money. Stay away from Empowr and the like. Instead try my recommended program and I believe you will love it. Can you send me your WhatsApp number please ??? Sorry, I can’t. There are so many spammers out there. I don’t who you are. If you any specific questions you can contact me via my contact page. I will get back to you shortly. Between not showing the initial fees required to join and the amount of complaints it seems obvious not to join. You did a great job with the review and hopefully saved a bunch of people money. That BBB rating you show should also be an indicator. Not that I always go with them. But when you got that many people complaining about not being notified about taking their hard earned cash there lies a problem some where. I’m of the same opinion Ken. Though Empowr is not a scam but I think by writing my review and exposing some facts about this program I will save some people from wasting their money. You’re right. I think BBB rating is not always the best indicator because some companies complained about BBB in the past. But when there are so many complaints from members it means something is definitely wrong with this program. I have a friend that was talking about Empowr and that he’s thinking of trying them out so I’m glad I found your review. The information you provided makes me feel that they are not legit at all. I can’t see that I would be very happy waiting 60 or 90 days to get paid. It would get me feeling nervous. Not being able to cash out earnings sounds like they are really scammy. 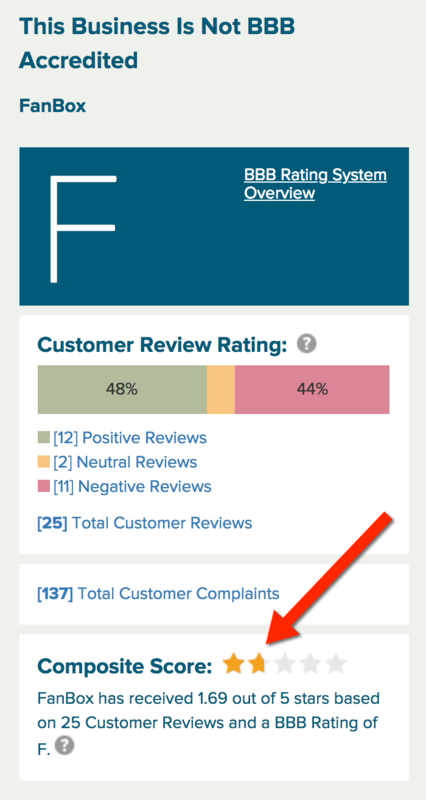 I’d say BBB and the complaints on Empowr says it all. Glad you checked on what people are saying about them. Thanks for writing this and I’ll definitely let my best friend know about these guys. Sure, waiting 60 or 90 days is too long and is not going to be a solid opportunity to make money. Plus many complaints and withdrawal issues. All this makes shows this opportunity not so good looking to be honest. I’m glad you can help your friend and save him or her from this time waster. I once was a member of another similar program called Traffic Monsoon and lost approx. $450 in that program. I will never participate in such untrusted programs. Thanks Rufat for another educational online scam review. Honestly, after reading your post for I did not understand how they can make money. Actually, after your statement that it is complicated and problematic with cash withdrawals for me, it is very loud signal to keep clear of this. It would be interesting to know how many people have fallen into this trap. I have to agree with you Andrejs. There are too many warning signals for one single program. I wouldn’t dare to join it or spend my money simply because I don’t know the outcome. Maybe I will make money or maybe I will lose. I don’t know. I prefer more reliable programs like this one. I have to agree with you about Empowr, I joined a few years ago and it seemed that every time I turned around they wanted more money and not just a few dollars either they wanted hundreds so I left them. You give a great review on Empowr but personally I am more negative than you on them, Thanks for the great review and people should take note unless they have to much money to spend. Thank you for sharing your experience with Empowr! 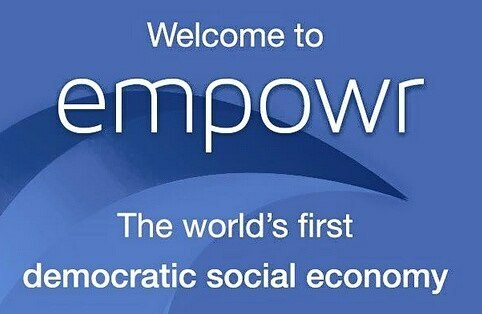 I hope it will help others get a better idea of what Empowr is all about. I understand that you’re more negative than I but I did so because everyone’s experience is different. If I say only negative things then others will criticize me for being unfair. That’s why I tried to provide as many details as possible so my readers can make their own decisions. But anyway thank you for the comment. I could not be more happy after you have made a review on this website as i have a friend who is a member and she cannot do anything or provide any positive feedback of the company all she does is complain with all the difficulties and impossibilities of making money. I really don’t know. I can’t help your friend. It’s better to contact their support and ask them maybe they will be able to help. I’m not affiliated with Empowr and can’t help. Hi Rufat. First of all if a program such as Empowr does not make it available anywhere on the site facts about how much it would cost a member to join, then it cannot be legit. How in the world could this company be able to recruit new members, (or more precisely have actual members perform the recruiting as there way of making money in an online business) if nothing is revealed about initial membership costs? Are they hiding something by not revealing this fact? Or are they willing to insult people so badly, believing that new recruits would just join anyway despite not knowing how much it would cost them to sign up? Not even counting the failure of this company to reveal their membership join fees, reading your review the company is just so vague in presenting concise info on how a person would earn money through their system. This opportunity has loser written all over it. Anyone willing to join this program despite the fact that such little info is provided on their website should have his/her head examined to be blunt. More than likely, he/she would truly regret joining this fraud program called Empowr. I understand JeffWA. Not everything is clear for me too regarding Empowr. I really can’t say much about it. I just did my research and found some facts and decided to share it with others. My main concern is that there are really many complaints and issues in this program. But I think everyone should make their own decision to join Empowr or not. I personally would never join it because it’s not completely transparent. This seems like another site that has attractive graphics and amazing promises. I mean, they have the levels of payout that seem so attractive! But I really don’t like that they automatically transfer your PayPal funds into the Empowr account if things go below $2 (I guess an example of charging your account without notification). It definitely seems like this site is a gamble since you can lose a lot more money than gain. 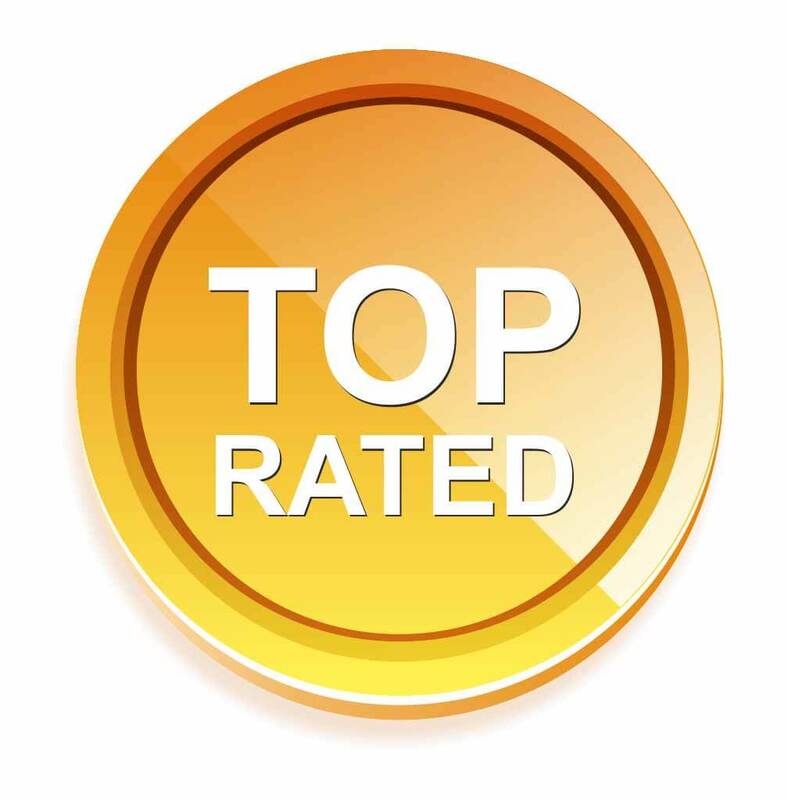 Thanks for reviewing – I’ll look into your other recommendation too, the wealthy affiliate one. Is it really free though? I’m always scared of scams. Yes, you’re right. Like you I don’t like the idea of charing the account without notification and that’s why many people close their accounts, lose money. And I don’t see any value in their program to be honest. I don’t think Empowr will be profitable for long. sooner or later they will stop their shady project. Regarding my recommended program, don’t worry. It’s absolutely free to try. I’m a member of this program too and you can always contact me and get support once you’ve become a member of the program. Is this company completely different from empower network? 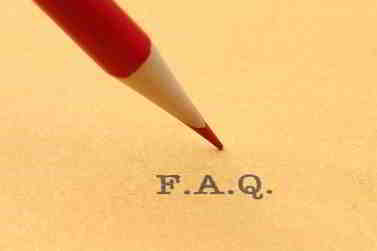 I am asking because I have heard of empower network and heard they were shut down by the FTC a couple of years back. Also by the way they are taking money from other members and distributing it to other members, it sounds very ponzi like in nature. Do they expect you to recruit new people as a way to make more money? Yes, it’s completely different from EN. To me it sounds like a ponzi too. I don’t see much value in the service that they provide. It’s just for the sake of taking money from one group of people and giving it to another group. Recruiting is normal and is part of almost any program. Generally speaking Empowr is a little shady in my opinion. Anyway future will show. Rufat, I just read your post on My Empowr. I am relatively new to online business opportunities and I am continually searching for new ways to generate income. I appreciate your honesty and attention to detail on your review of this business. It definitely looks like one to stay away from. Just the “F” rating form BBB says it all. Thanks and best to you. Thank you for the comment Mike. Sometimes I disagree with BBB ratings but most of the time it’s pretty accurate. Regarding this program it’s correct. I found too many complaints for this relatively new program. You’re right. It’s definitely not a program I would recommend.